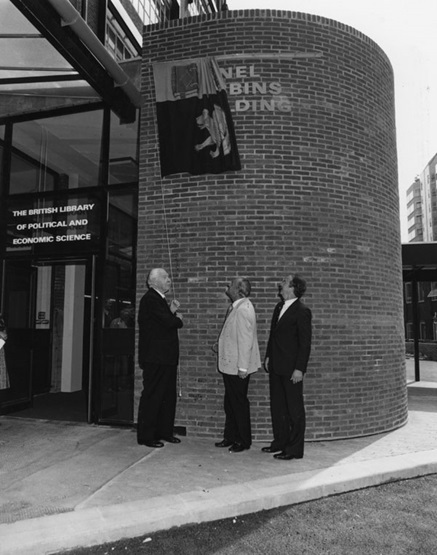 Lionel Robbins’ long history with LSE, as student, lecturer and Chair of the Economics Department, would be reason enough for him to have a place of honour somewhere in LSE but the reason his memorial is in the Library is due to his central role in the Library Appeal. This was the successful appeal to raise the funds for the purchase and conversion of this building for use by the British Library of Political and Economic Science (BLPES). If you’re a visitor to LSE then you’ll know this building is named the Lionel Robbins Building, a tribute to his work for the appeal. There are a great deal of references to the Library Appeal in the Robbins Papers, from the initial planning and development reports, minutes of meetings of the Appeal Committee, correspondence regarding the logistics of organising an international appeal, and marketing materials produced to promote the appeal. The idea of purchasing 10 Portugal Street, then known as Strand House and the HQ and warehouse of WH Smith, was first raised with Robbins by the then Director of LSE, Sydney Caine, in 1966. The University Grants Committee agreed to cover the cost of the building and conversion of the building if LSE could raise the funds to purchase the site. 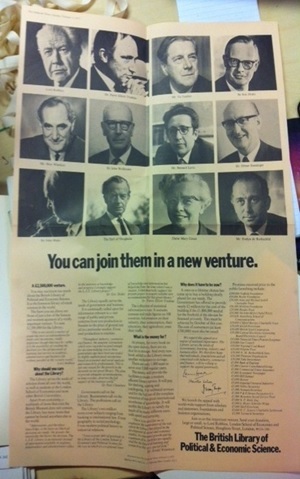 A special committee was set up to begin thinking of ways to raise the money and Lionel Robbins agreed to join. As WH Smith were not ready to sell the building until 1972 they had some time in which to come up with the money. With all his contacts Lionel Robbins was an ideal person to be involved in fundraising for the Library and it wasn’t long before he started canvassing friends and colleagues abroad to gauge interest and support. In 1970 a formal offer of £3,780,000 was made by LSE and accepted by WH Smith for purchase of Strand House between 1973 and 1975. A Public Appeal was launched which would be led by Lionel Robbins. This appeal was to be worldwide and involve LSE Alumni from all corners of the globe. An understanding of the wide scale of the appeal can be seen in the minutes of the Library Appeal Working Party which discuss appeal work which took place in America, Canada, Thailand, India, Malaysia, Hong Kong, Japan, and throughout Europe. These minutes and papers also discuss the aims of the appeal, the direction it should take, and the role of all those involved in the appeal. The folders contains some really interesting marketing and publicity material produced for the appeal. 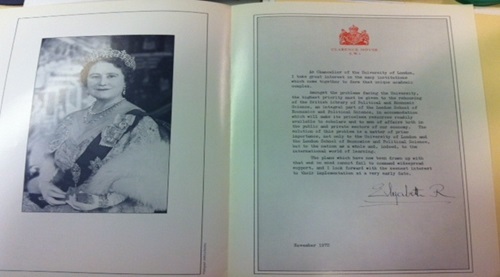 The support for the appeal, including from HM Queen Elizabeth the Queen Mother goes some way to explaining its success. The strong reputation of LSE and the BLPES worldwide was of course another very important factor. The files and files of material which Robbins kept relating to the Library Appeal serve to illustrate how important the appeal was to him, and why he was willing to forego his days of relaxed retirement in order to lead the appeal. His hard work was rewarded when the building was named after him, and he was present at the opening ceremony in 1979, when the building was formally opened by the Queen Mother.